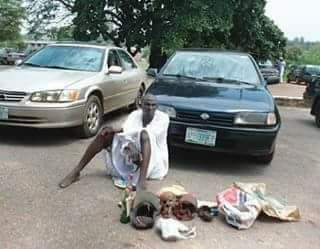 The Oyo State Police Command yesterday paraded a 55-year-old pastor over unlawful possession of a human head, buffalo horn, as well as gunpowder and charms. However, Isaiah had an explanation: he wanted to use the human skull as fortification to ward off armed robbers from the land on which a branch of his church is being constructed. . In an interview ‘Prophet’ Isaiah a.k.a Agbojesu, said: “There was a demolition at Pakoto, Sango, Ogun State, where I reside, and it was there I found the human skull. Unfortunately, armed robbers have been disturbing us at my church branch in Oyo State, so I wanted to use the skull to make some spiritual fortification so that armed robbers would stop disturbing us there. The charmed soap found with me is to get favour and mercy. I also intended to bury the horn found with me along with the human skull for the fortification, because it is a large expanse of land. . I know human skull may be used for other things but what I intended to use it for was to ward off armed robbers by making the site unattractive for them. All I would do was to mix some herbs with the skull, make some incantations and instruct the skull to ward off armed robbers from that particular area. . Although I am now a prophet, my father used to be a herbalist. That was how I learnt how to prepare some spiritual potions. But I know that Christianity does not support charms and diabolism. I started my church in 1980. .